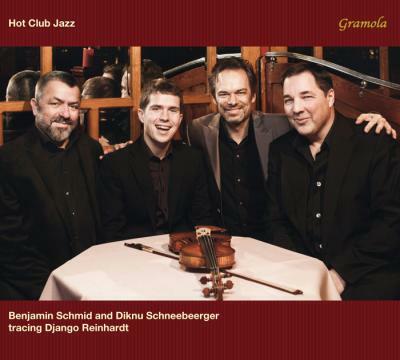 Salzburg/Wien – With his latest recording "Hot Club Jazz" (Label: GRAMOLA, 99069), a tribute to the legendary "Quintette du Hot Club de France", Austrian violinist Benjamin Schmid once again confirms his exceptional position among the top violinists of the present time *. The album, released in March 2015, has now been awarded with the Quarterly Critics' Choice prize by the prestigeous German Record Critics' Award for its outstanding artistic importance. This makes Benjamin Schmid the only violinist in the world who has received highest-ranking awards for classical violin concertos as well as for Jazz recordings. Since his joint performances with legendardy Jazz violinist Stéphane Grappelli in the years between 1986 and 1994, Benjamin Schmid is dedicated to further the enhancements of this first authentic European contribution to Jazz. musicians", comments Richard Winter, boss of the Viennese label GRAMOLA. The "Hot Club Jazz" album (feat. Diknu Schneeberger, guitar) is the next out of recent international award winning recordings of 20th century violin concertos with Benjamin Schmid (including those of Wolf-Ferrari, Reger, Ligeti). And it underlines why Benjamin Schmid is celebrated as one of the great violinists of his time.